I have heard it all before– all with a contorted, confused, disgusted face to go with it. Truth is, it’s not all that bad. There are a lot of things about the Greater Buffalo/Niagara area that people refuse to understand, primarily because we are not a small city-state like our downstate counterpart. Well guess what– we aren’t them, and we aren’t pretending to be. Buffalo is NOT New York City, Boston, Los Angeles, Philadelphia, etc, etc. It is not meant to be. It’s exactly the way it should be — a mid-sized city with lots of history, good neighbors, great food and drink, and Canada as our “bestest” next door neighbor. Yes, we get snow. Buffalo winters can be challenging no doubt, but I can tell you there are other cities in the state of New York that get much more snow than we do on average. We just happen to sit on the banks of the great lake effect machine known as Lake Erie. Buffalo has the GREATEST sports fans in the world. You will not find a city who loves their sports teams more than us. We eat, sleep, and breathe the Buffalo Bills and Buffalo Sabres. We will forever shed tears when we hear the phrases “Wide Right” and “No Goal”. The food is the best you will ever have. Besides being the birthplace of the chicken wing, we have Bison Dip, Weber’s Mustard, Wardynski and Sahlen’s hotdogs, Fish Fry, Beef of Kimmelweck, La Nova pizza… I could go on and on. It is very affordable to live here. Buffalo real estate is ridiculously affordable, and quite a commodity right now. Albeit we have some of the highest taxes in the country (Thanks, New York State), I guess you can say the high taxes are countered by our affordable housing prices. Buffalo has some of the best architecture in the world. Get to know names such as Rand, Ellicott Square, Electric Tower, Guaranty Building, Central Terminal, and much more. We get four seasons. Ok, so maybe some seasons tend to stick around longer than others, but we get FOUR FULL SEASONS. Buffalo summers are the best. I still don’t understand why people decide to go to Mexico in July. We are so lucky to have the summers we have. Our temperatures are juuuust right — perfect amount of humidity and temperature. Outdoor activites are world class. Fishing, boating, skiing, hunting….it’s all there. Buffalo is conveniently situated between two great lakes. One, as I have mentioned above, hugs us tightly — Lake Erie, and the other, Lake Ontario, is about 45 minutes away, all depending on where you are going. Buffalo is rising again, and it is beautiful. We are taking our history and using it to mold our future. Buffalo is no longer a place you drive by on the thruway on your way to Niagara Falls, it’s a DESTINATION. And, as someone who works in downtown Buffalo, I know this is the absolute truth. Yea, Niagara Falls is just up the thruway. Enough said. Buffalo is home to the largest self-guided garden walk in the country. Garden Walk Buffalo includes more than 400 gardens, and it keeps growing each year. Held at the end of July, you get a side of history with your garden walk as you tour the historic neighborhoods of Buffalo! Though he is most recognized for designing Central Park, America’s first Landscape Architect Frederic Law Olmsted’s first major project was to design a park and parkway system for the city of Buffalo in its Industrial heyday of the late 19th, early 20th centuries. 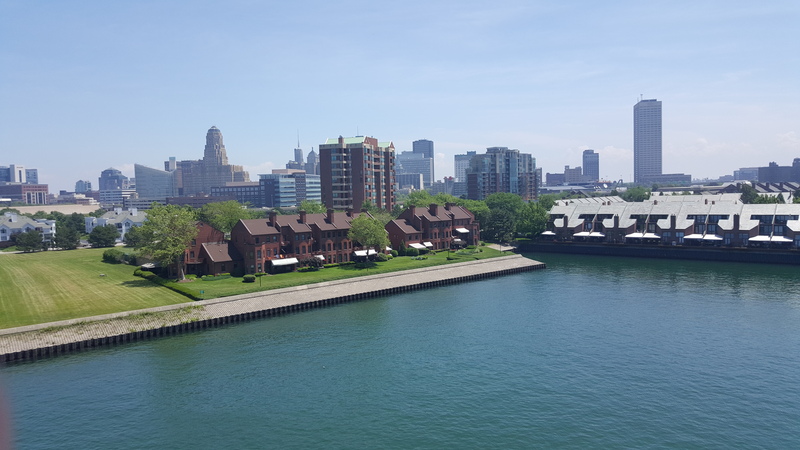 Buffalo is home to some of renowned architect Frank Lloyd Wright’s greatest designs. Buffalo has the second largest open air theater in the country– second only to New York City. Buffalo was the cradle of the American Arts & Crafts movement. And, last but not least, Buffalo’s bright future. It includes HarborCenter and Canalside Buffalo. Rebuilding, reinventing, and making our own unique mark on the world. What a great post! Well I have certainly learned a lot about your home city and I think it sounds fabulous! Thank you, though I have noticed now I left a few important things out and I will have to edit it sometime. That’s the beauty of static pages. I use the tar out of them and edit them OFTEN. It’s a great compilation, very organized. Thank you, and yes, I omitted some big things that were in my original draft, but with a toddler on your lap, you tend to get side-tracked to say the least! Ha! Thank you! We are part of the “Rust Belt” cities, but there has been more progress in the past couple of years than their has been in decades! It’s very exciting!